This Sunday, Dec. 10th is your last chance in 2017 to shop the bounty of the Lake Forest Park Farmers Market and the ever-popular Holiday Crafts Fair! Need a few, final stocking stuffers? Need eight nights of fabulous Hanukkah delights? Need one dazzling show-stopper gift for that special someone? Whatever you’re looking for, the Holiday Crafts Fair will have it. Over 30 Washington artists and crafters will offer a dizzying array of handcrafted jewelry, watches, pens, home décor, toys, and holiday novelties. From fine arts to fabric arts and wearables, the phrase “something for everyone” just might have been invented for this occasion! 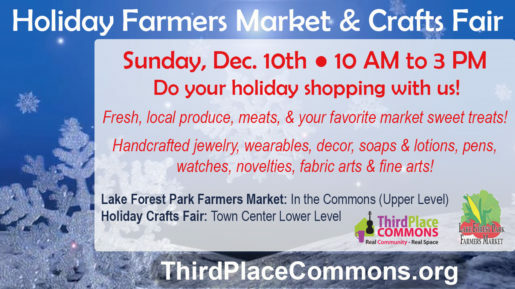 The December farmers market will take place inside at Third Place Commons on the upper level of Lake Forest Park Town Center, while the Holiday Crafts Fair will take place just downstairs on the lower level. 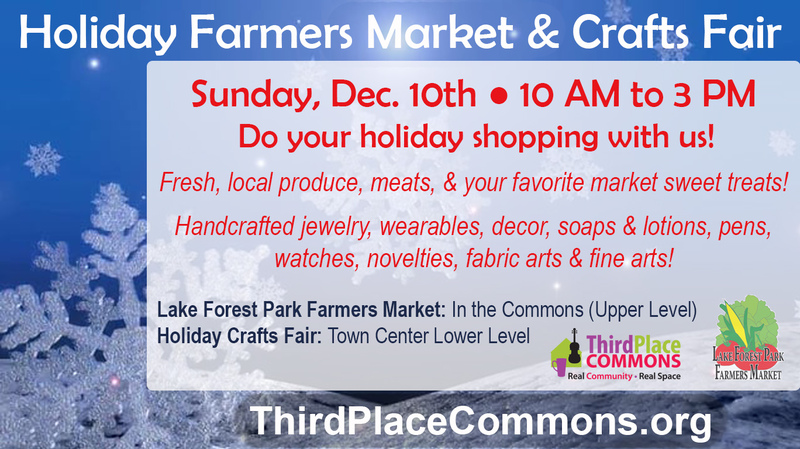 Both the farmers market and crafts fair will take place from 10am to 3pm. If you’ve got SNAP benefits (or know someone who does), don’t forget that SNAP cards are always welcome at the Lake Forest Park Farmers Market. And you can still get your matching Fresh Bucks (with no limit) at the market, too, so don’t miss this chance to make your money go further. This is also your last chance to use those 2017 Market Bucks, so bring them to the market this weekend and use them! And we also hope to be joined by C&G Plants, Caruso Farmers, and Raft Island Roses. So be sure to join us for a great day all around. By the way, want to support great community programming like this and hundreds of other free events all year long? 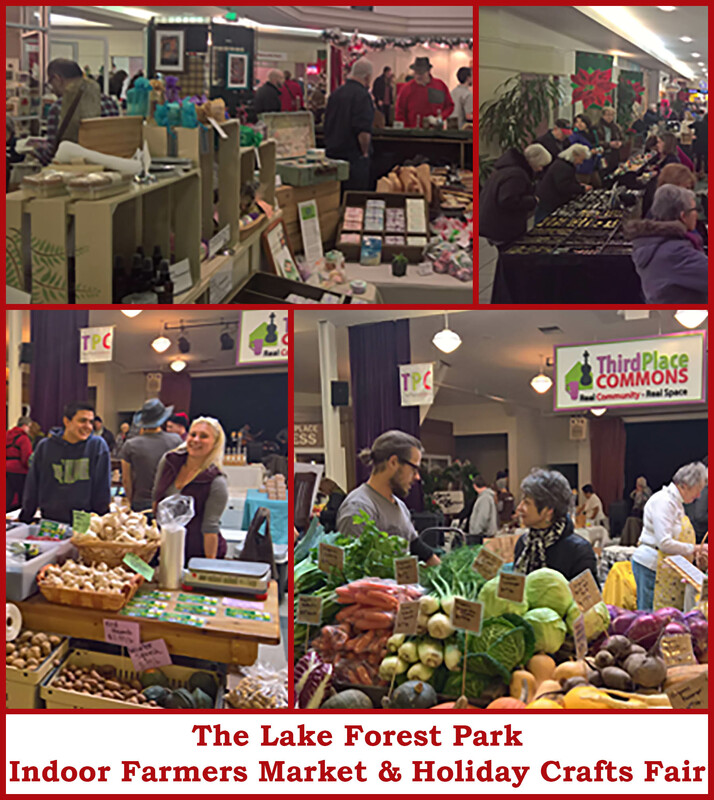 Make a tax-deductible*, year-end gift here to keep our farmers market and shared Commons Community strong and thriving all year long. Thank you and see you at the market!